"God bless the United States and God bless New York City" proclaimed a sign as the bus rolled through a small Indiana town. In October 2001, author Bill Markley was traveling by public bus from Pierre, South Dakota, to Virginia Tech in Blacksburg, Virginia, for a Delta Kappa Epsilon fraternity celebration. The day Markley left South Dakota began simply enough, but soon tragedy unfolded when a deranged man of Croatian descent slit the throat of a Greyhound bus driver causing an accident and throwing the nation's bus system into disarray. 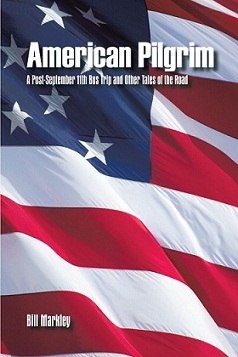 American Pilgrim is an honest account of life on the bus, the characters on the bus, bus culture, and the mood of the American people--reflective, patriotic, and upbeat. In those challenging days after the attacks on 9/11, everyone struggled to make sense of the world; as Markley worked on this story; it grew beyond the story of a simple 3,000-mile bus trip. He recalls many of his life's detours, recounting past events at locations the bus traveled through and people associated with those locations--a rambling personal history of people, places, and things. The trip took on new meaning and became a spiritual journey into the country's past and Markley's past.